What happened towards the end of regulation? What does this graph represent? Is this the probability a team will win as the game is being played? If so, that's pretty cool. What's with all the Seattle doubters? Go Seahawks! What could be possible titles for this graph? What happened just before the end of regulation time? Is this a graph of probability over time? 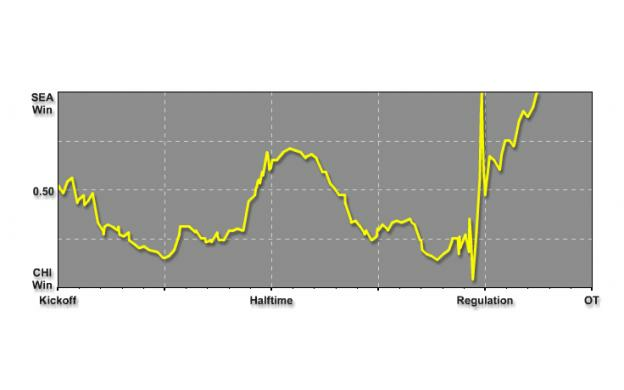 What can explain the spikes near the end of Regulation? Is this the position on the field? How did Da Bears lose this game? At approximately what points do both teams have equal odds at winning? Do you think there was a hail mary? What happened at the end of regulation? What is the title of this graph? What is this graph illustrating? What is the y-axis measuring? how is the probability calculated?